Laboral Kutxa Vitoria reached a historic milestone and beat previously undefeated Olympiacos Piraeus 89-70 in the Game of the Week to get an important win in the hunt for a place in the Top 16. 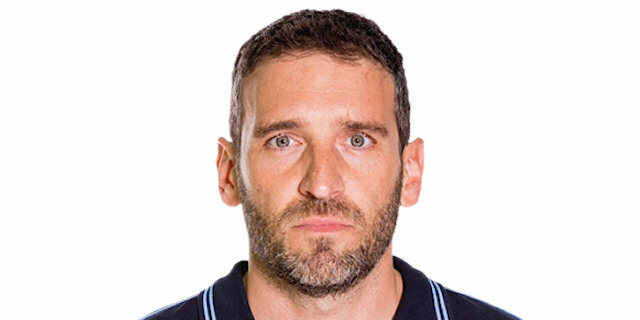 Laboral, which scored its 25,000th Euroleague point during the second quarter, improved to 3-4 and will be in at least a share of the fourth place in Group D on Friday. 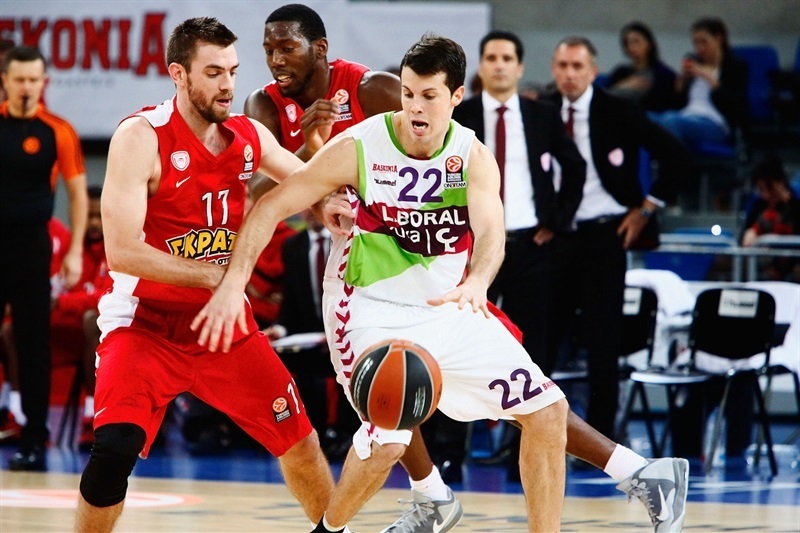 Meanwhile, Olympiacos now holds a 6-1 record, but remains two wins clear atop of the standings. 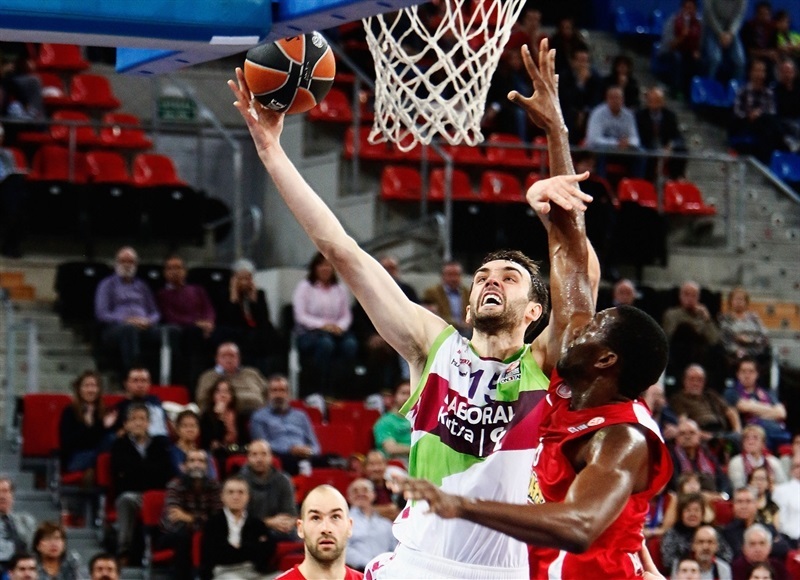 The Reds had a better start to the game with Vassilis Spanoulis becoming the fourth player to 2,500 Euroleague points in the first six minutes of the game, but Laboral used triples from Fabien Causeur and Thomas Heurtel to go in front, and never relinquish the lead. The hosts led 44-37 at halftime, then opened the third quarter with a 9-0 run with Tornike Shengelia and Davis Bertans leading the charge, and the margin never dropped below 10 points the rest of the way. 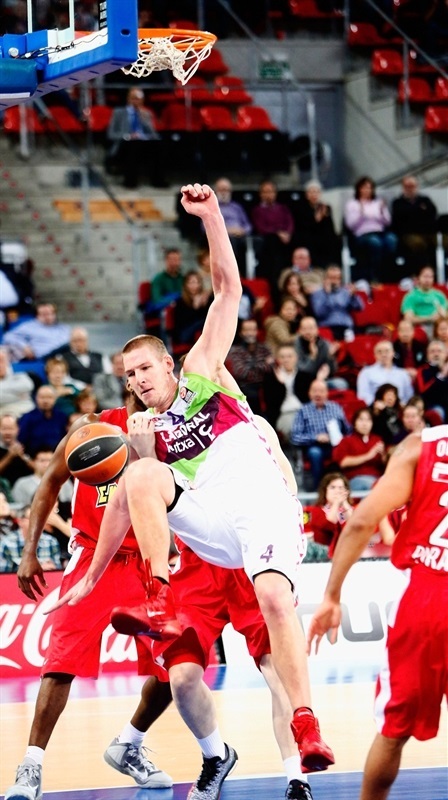 Heurtel netted 18 points, and Bertans had 17 in victory. Shengelia scored 14, while Mirza Begic collected 12 points, 7 boards and 3 blocks, and Fernando San Emeterio also scored 12 in victory. 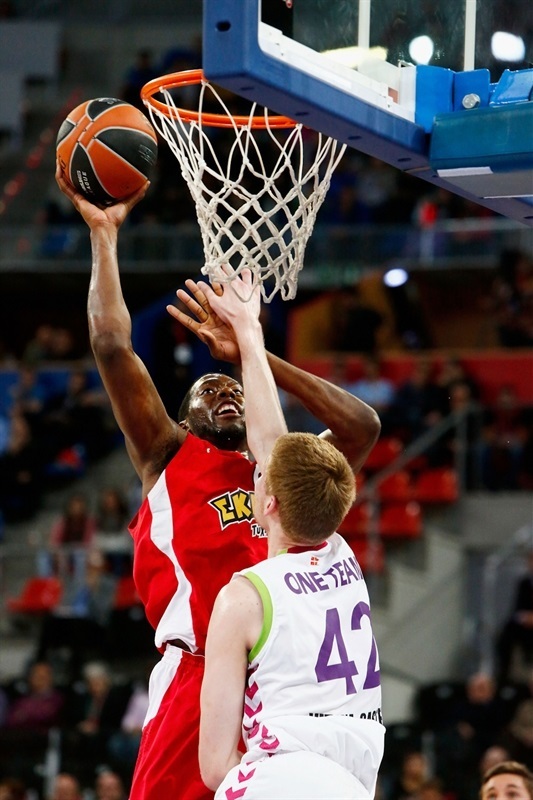 Spanoulis finished with 27 points for the Reds, and Bryant Dunston scored all 12 of his points in the first half. 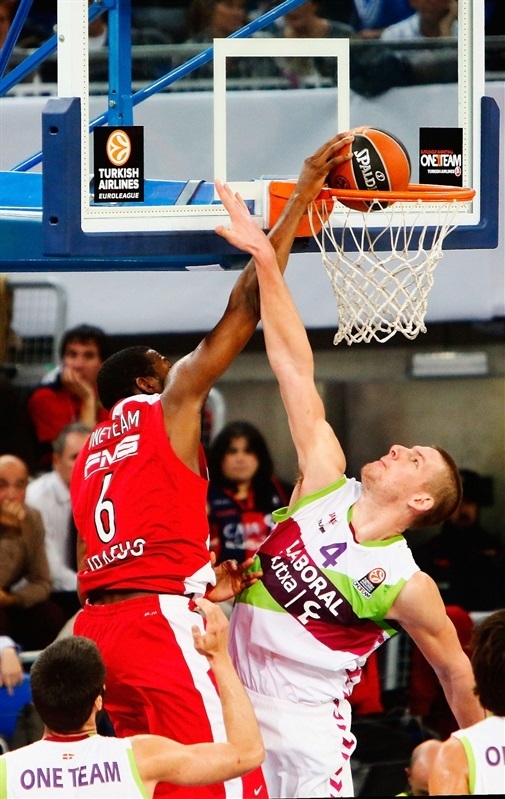 A pair of big blocks from Shengelia and Colton Iverson opened the contest, before Spanoulis opened the scoring after two minutes with a layup and in the process becoming the fourth all-time leading scorer of the competition. 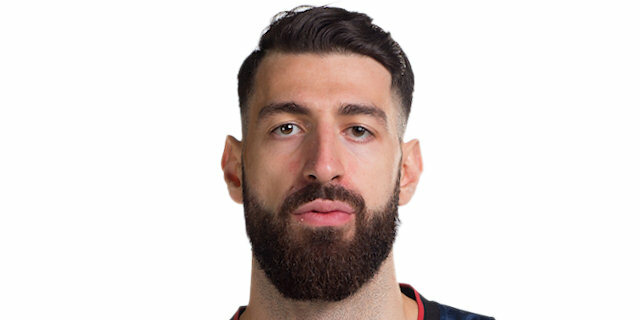 Davis Bertans hit from downtown to end a three-minute scoreless run for the home team, but Vangelis Mantzaris went all the way for the visitors and Bryant Dunston scored underneath after a feed from Spanoulis. 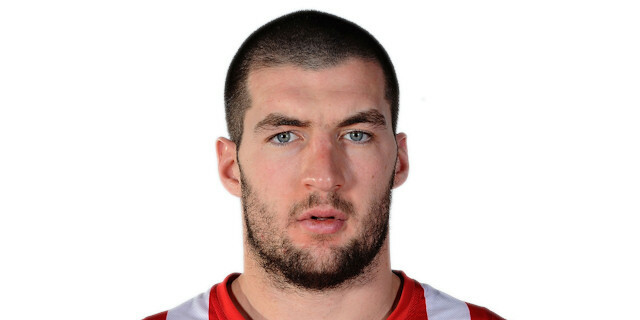 Shengelia answered with a spin move on the other end, before Spanoulis reached another milestone, 2,500 points in his Euroleague career, by sinking a three-pointer from the corner after six minutes for a 7-9 edge. 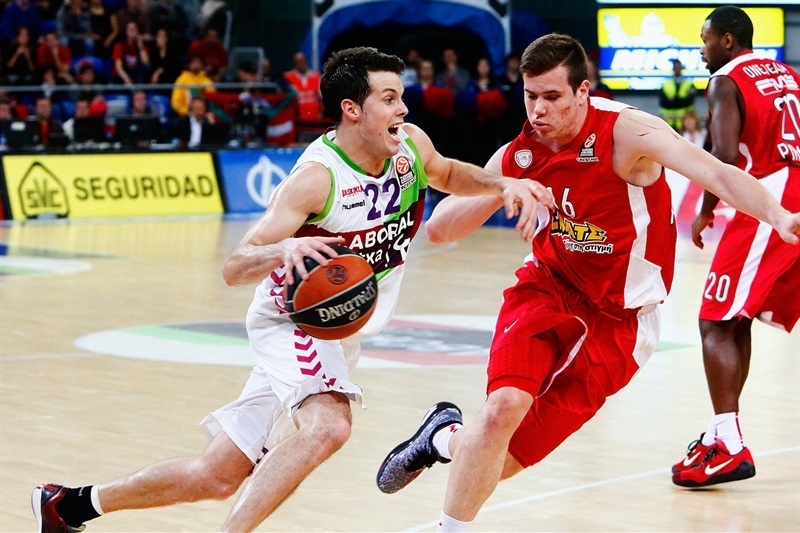 Heurtel copied him right away, before Dunston's jumper kept Olympiacos ahead 10-11. Shengelia stole the ball and Causeur finished the break with a triple, before Begic was perfect from the foul line, giving Laboral a 15-11 lead. Spanoulis hit a mid-range jumper, but back-to-back three-pointers from Causeur and Heurtel raised the margin to 20-13 late in the quarter. 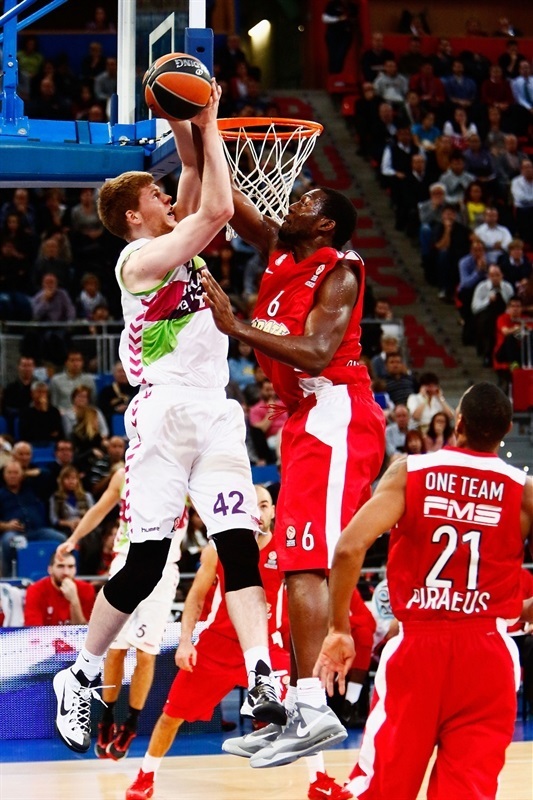 Dimitrios Agravanis scored a jumper, after which Bertans and Othello Hunter exchanged acrobatic lay-ups for 22-17. Begic, still perfect at the free throw line, made it 24-17 after 10 minutes. Spanoulis drained 3 free throws cutting the deficit, but Begic turned the baseline to make a huge two-handed dunk. Olympiacos reacted with a floater from Kostas Sloukas, and a powerful baseline dunk by Tremmell Darden, before San Emeterio scored a short jumper made Laboral the first team in competition history to 25,000 points. A three-pointer from Sloukas got Olympiacos within 30-29, but Sasha Vujacic hit from mid range to keep the home team in charge. San Emeterio got hot, scoring from the foul line and adding a deep three for a 37-31 lead. Dunston made a slam, but Kim Tillie was aggressive on the other end to score inside. Spanoulis and Heurtel both scored short jumpers for a 42-35 lead and after Dunston added another slam, Vujacic finished the scoring in the half at 44-37. Shengelia made a steal and dished it to Heurtel for an easy fastbreak layup to start the half and spark a Laboral run. Bertans drove for a layup, before Shengelia found Causeur on another fast break for a wide-open triple. After a timeout, Shengelia went coast-to-coast to make it 53-37. Spanoulis made a short jumper to snap the 9-0 run. Agravanis fought for a put-back, but Shengelia scored 4 more points, and Heurtel banked in a runner to make it 60-42. Hunter scored from close range for the Reds, but Bertans sank a three and Begic made a layup, helping the margin reach 20. Spanoulis drove for a layup, and Oliver Lafayette finished a fast break to cut the margin, forcing the hosts to call a timeout. In the final minute of the quarter, Begic had a pair of offensive boards that led to a layup, before Agravanis drove for a layup that made it 68-52. San Emeterio got things going in the quarter, but with a basket-plus-foul from Darden and a triple from Lafayette the visitors came within 70-59. But Bertans nailed another one from downtown as both defenses held their own, keeping the game scoreless for two and a half minutes. Shengelia made a pair of free throws, before Spanoulis and Bertans traded layups to make it 77-61. Spanoulis drove for an acrobatic reverse layup-plus-free throw, but Shengelia got to the free throw line again, sinking both and not allowing Olympiacos to gain ground. 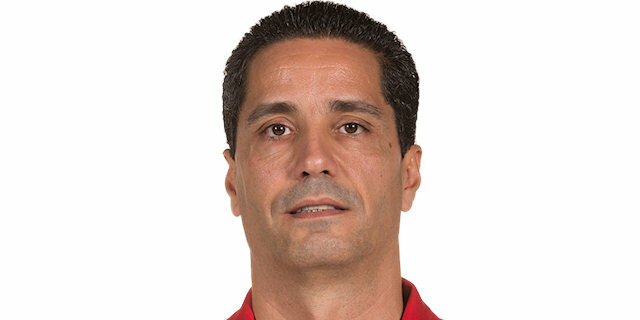 Olympiacos was within 79-66 with three minutes to go, but Heurtel was on six trips to the free throw line after a pair of technical fouls, and Begic made a put-back as the game came to its end. "We completed a good game, playing well for 40 minutes That's what we wanted to achieve. We knew that we needed to play good basketball all game long, because it wouldn't be enough to play just 30 minutes against a team like Olympiacos. We went through some problems and ups and downs, but when they reduced the difference, we managed to keep calm and some players showed up to contribute and help. We are very happy because this win means we are still alive in the competition. The good offense we played tonight is a consequence of the good job we did in defense. We were solid, letting them score just 70 points, and I would like to stress the good defensive work of Causeur, Vujacic and Iverson, players with no shining stats, but very important from the team perspective." 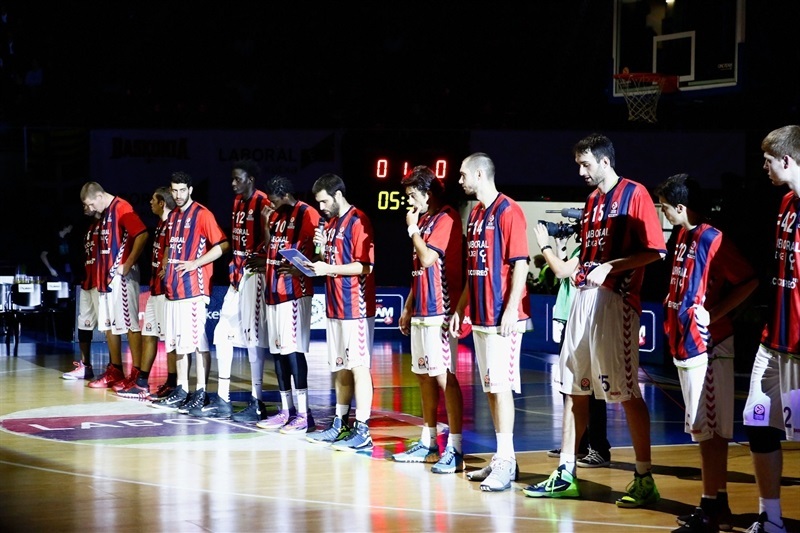 "First of all I want to congratulate Laboral Kutxa for their win tonight. They played a very good game. We were not ready to follow our plan defensively. We were not good, especially on the defensive end. We allowed easy points and from the beginning of the game we were not ready to stop their key players, so they were able to make their game. When the home team scores 90 points, it's too hard for a visiting team to grab the win." "We knew before the game that our only options were to win or to win. We were very aware of what we needed, which was to do a very good job on defense, and we did it. We focused on trying to play as a team at both ends and all game long and I think we achieved it. These factors were the key to winning this one." "It was not our night today. We need to fix some things we did wrong in this game. We had a difficult trip, and things didn't came out as we expected during the game, but we must keep doing our job, go ahead and look for the next game. 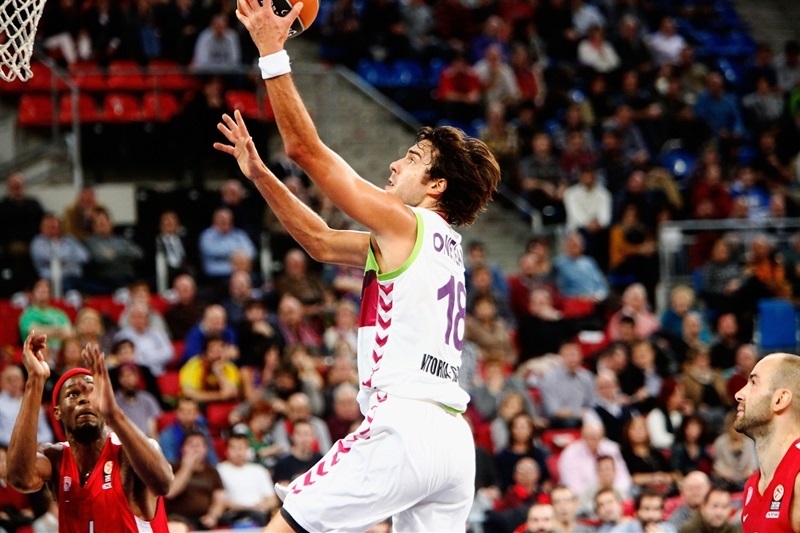 I think our approach was bad tonight, and Laboral Kutxa wasn't."